A new Kinect wrestling game will give you the true feeling of what it's like to be the Hulkster. I haven't been that into wrestling games ever since the WWE's Vince McMahon broke all of our hearts by shockingly revealing that professional wrestling is staged, but a new title from Majesco threatens to reinvigorate my interest. Majesco's Hulk Hogan's Main Event is officially endorsed by the Hulkster and tasks players to become the greatest entertainer in wrestling history through their own bodies with Kinect. In Hulk Hogan's Main Event, players are instructed in the ways of wrassling by Hulk Hogan himself. After creating a unique wrestler, players will control that wrestler through Kinect by replicating famous Hulkster poses and performing dozens of combos. The more dynamic your motions, the better your in-game performance. Majesco hasn't revealed if ripping off your shirt and yelling "brother" will be beneficial. The game includes 9 different venues from the backyard to a packed stadium, a tournament mode, and two-player tag-team. In addition, players can pick up chairs, ladders, and other illegal objects while the referee is distracted. Sometimes Hulkamania running wild on your opponents just isn't enough. But enough about that, the primary draw of Main Event in my mind is that you get to hang out with Hulk Hogan. Who doesn't want to pose like the Hulkster and then have him give you a vigorous thumbs up? 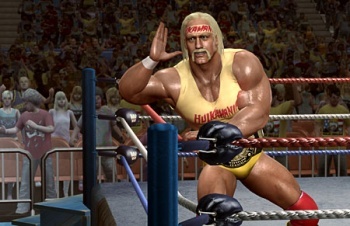 Hulk Hogan's Main Event will be out in fall 2011 for the Xbox 360.